The centerpiece of Rick’s Corolla is the gleaming $250 4-liter Lexus V8 crammed between the strut towers. “I started autocrossing five years ago with a 1988 Supra Turbo,” Rick explains. The car had good power, but it was a little heavy for his tastes. Plus it was getting expensive to maintain, he adds. Rick figured that an early-’80s Corolla would make a better alternative. 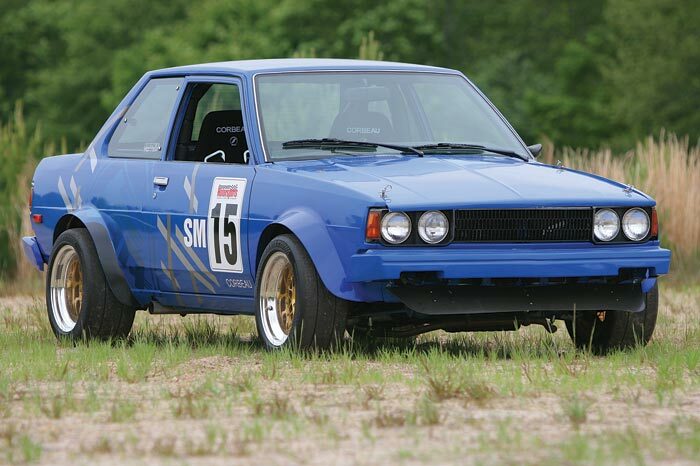 The promise of low-cost parts was one of the things that drew Rick to the Corolla, but he soon felt that the little 1.8-liter, 3TC-spec engine was in need of more power. The discount aspect went out the window when he installed a race-ready, high-compression engine. From a Street Modified perspective, the only thing that mattered regarding engine selection was the name on the valve cover. Absolutely any Toyota engine would be legal for the class, regardless of its era or origin. Better yet, as Lexus is a marketing alias for Toyota in the U.S., even bigger advantages were available. Some Internet research revealed that the Lexus V8 could be squeezed into the Corolla engine bay. The 1UZ-FE engine was used in the brand’s top-of-the-line models during the 1990s, powering cars whose names ended with 400, like the LS 400 sedan and SC 400 coupe. Visions of a class-legal and very modern 4-liter Lexus V8 nestled in the nose of Rick’s lightweight rear-wheel drive Corolla were just too tempting to ignore. The headers were fabricated by a former Holman Moody employee. Rick got in touch with Bullet Cars and placed his order, getting the bellhousing, ceramic clutch, pressure plate and flywheel that would mate the Lexus V8 to a five-speed transmission sourced from a Toyota Supra. 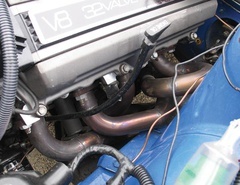 While Rick had Bullet on the line, he also ordered one of their performance intake camshaft kits and an Autronic SM4 engine management computer. “This wasn’t absolutely necessary, but if later I wanted to raise the engine output, the SM4 could grow along with the motor,” Rick says of his ECU decision. 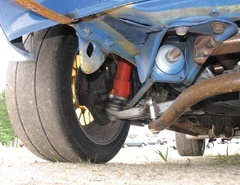 The swap also required Chris to remove the old steering box, which was then replaced with a rack from a second-generation Toyota MR2. “The steering rack was a major change, but none of the firewall or transmission tunnel was cut for the install,” he explains. “The shifter even went in the same hole,” he laughs. The biggest challenge to making everything fit would involve the exhaust system, as there wasn’t much space on either side of the engine. Rick credits his luck once again for the solution. Rick has tuned the car for autocross in the Street Mod category. Once all of the installation issues had been addressed, Rick pulled the engine and performed a comprehensive freshening, replacing the seals, timing belt and waterpump. When Rick hit the ignition to bring his beast to life, the first real hiccup revealed itself: The engine started right away, but a crossed wire in the Autronic harness meant that the timing was completely awry. “It was a miracle it fired at all,” Rick says. “We discovered that it was retarding to 5 degrees.” Correcting the problem put the timing at 70 degrees of ignition advance, which got the car running and allowed them to tune it. Rick was joined by Steve Rankins, a friend and the local Solo chairman, and it took the pair four weeks to get the engine running correctly. Eventually, the engine was providing smooth delivery throughout the rpm range. Since it’s mostly stock, Rick estimates the engine is making about 260 horsepower and 270 lb.-ft. of torque—all from a powerplant that weighs only 80 pounds more than the original. And unlike his $6000 race engine, this low-buck V8 should exhibit reliability on par with any other nearly stock Toyota: damn good, in other words. Since Rick had to add ballast to meet the 2500-pound weight minimum required by the class rules, he’s banking that placing the required lead bricks at the rear of the car will help. The scales now show a perfect 50/50 front-to-rear distribution, while the left- and right-side weights are within half a percent. Rick’s only unsolved complaint has to do with the car’s brakes. “We had to take off the brake booster to make room for the motor, so [the brakes are] just working off the master cylinder,” he explains. “It takes a lot of input. It would be a lot quicker if we had the power assist back.” He confesses, however, that he’s not yet actively working toward a solution. 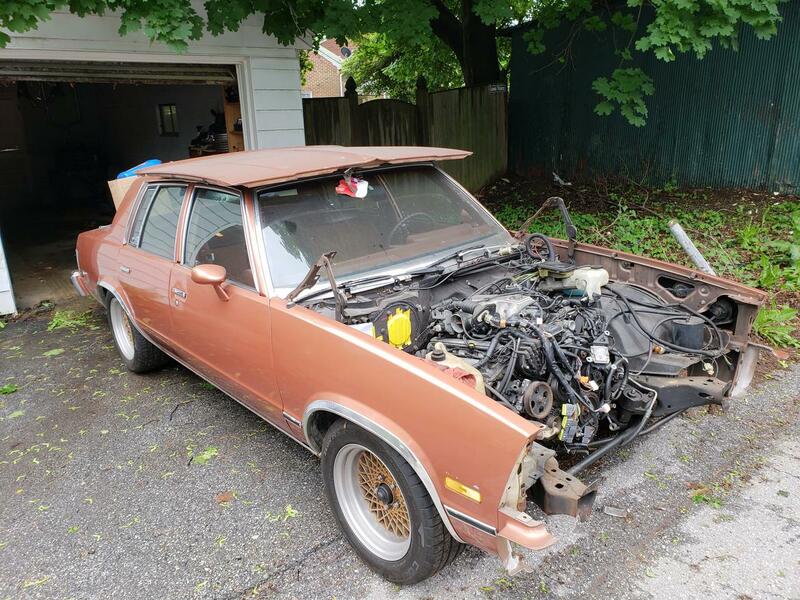 Rick Disbrow’s budget on the Corolla project—including the V8 engine swap, but less the previous trick engine—has reached about $12,000. However, a very similar result could be built for far less. It takes a great driver to squeeze the most out of a high-powered rocket like this old Toyota, and Rick is the first to admit that his own autocross talents are in their fledgling stage. 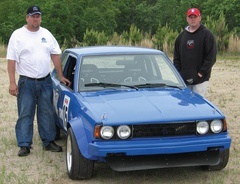 Rick has found a more experienced driver, Anthony Gallarini, to co-drive the car in regional and eventually national-level autocross competition. Rick is also planning on taking the car to an HPDE track day, something he enjoyed doing with the old engine installed. Based on that tough-to-ignore trait, it’ll be hard to mistake Rick’s Corolla for any of the standard variants Toyota ever let roll out of the factory. Hells yeah. Uzis are my favorite motors. Thats why I have one in my Malibu. Hope to have it done no later then next fall. What year is the Corolla? Article doesn't seem to say. Would a 4AGE 5 speed trans hold up to the V8 power do you suppose? Would it be a bolt-on to the Lexus V8? What trans is that? And there's no manual trans that just bolts up to the 1uz. Not sure of the specific year, but it's an E7x chassis. Wanna guess where my username came from? Yeah, I had one of that vintage. Early 80's, if I remember my generations correctly, this is a fourth generation Corolla. They're a lot of fun! Although... looking at this car here, it looks a bit different than mine did, I had square headlamps, perhaps this one is a bit earlier than the 1980 I had. The rwd transmissions that you're thinking of are the T50, and uh... I have my doubts that it would live long behind a 1uz, but I have no experience with how far that transmission can be pushed. A W58 is a common Toyota transmission that would be suitable for a 1uz in such a light car, and they're still reasonable to obtain. If you really wanted to go nuts, and R154 could be used if you really wanted to make sure it was gonna survive. Unfortunately (well, fortunately for a guy like me who has a couple of them anyway), they've gotten a bit expensive as of late. There's also adapters for Nissan 240sx transmissions and 350z transmissions. Lots of options. There is a UZ to ZF320 adapter. Holds 700ft*lbs, shifts well and is very common. Slap em together in a fun little car like this and it would be dreamy. Or use the kit to UZ your BMW. Who makes said adapter, please...? What year is the Corolla? Article doesn't seem to say. So...1980? BUt I agree that doesn't match the headlights. roundlights were 78-79, square were 80-82. My first cat was an automatic '82 Sedan. I always wanted to find a roundlight, 5 speed wagon or 2dr to play with. Mine was a fun little car for a clapped out piece of crap. That is indeed a 1980 Corolla. The twin circular headlights was a one-year design, the body-style was new for 1980. They went to the square headlights in 1981---- although it may have been mid-1981, as I've seen the circular headlights on 1981 cars. I know, as I had a 1980 in H.S and college......until I rolled it 5 or 6 times. Hard to be sure how many times it went over, as I was thrown from the wreckage. From that point on, I've always worn a seatbelt! I'd love to have another, but the rotary drag-race boys seem to have snatched all the decent ones up.....and jacked prices to absurd levels. anybody notice the original post was ten years ago ? Joe, my Corolla was a 1980 model year, and I had square lights. I'm wondering if it wasn't a trim / body style specific design, the difference between lights. Granted, my car had over 325k on it, one wheel that didn't match the rest, and a small pool of water from the large water jug in the back seat, so... hard to say what that car had done to it by the time I came along. As far as drag racing with these cars go, they do make a pretty good platform for it, nice and light, solid axle, reasonably large engine bays... buddy of mine has a 1980 notchback with a turbo 6M. It's stupid quick, to put it politely, to the point that he only runs 1/8 mile these days so as to avoid needing to cage it to run 9's in the quarter. Plus, it apparently gets a bit spooky at 140+, who would have thought they weren't really designed with that in mind?